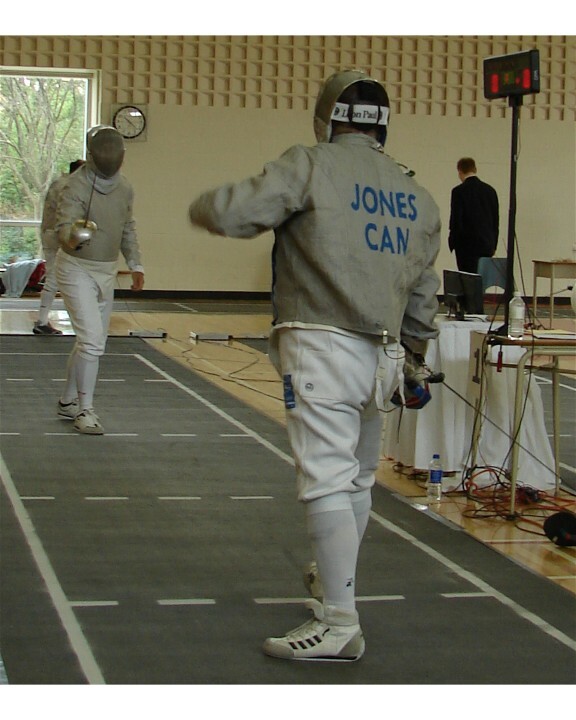 This is a picture of Steve and I.
Steve fenced in the veterans epee event at the Vet Capital Challenge in Kingston today. He also is a coach at the Canadian Fencing Academy. Back in September of 2005, Teena and I took an Introduction to Fencing class with Single Horizons at the Academy and Steve was our teacher that day. It was based on foil and I did enjoy it. Afterwards Steve asked who would like to stay around for some sabre bouts. My hand went up. When the sabre was placed in my hand, it felt like it belonged there. The bouts were exhilarating. I was sold! I thought it would be a great thing to do, once or twice a week on week nights, to get myself off the couch and get some exercise. A good healthy hobby. In 2006, I entered my first local competition. It was so much fun. My goal was not to end up last and I didn't. In 2007, for the first time I flew out for a tournament. It was the Canadian Nationals in Saskatoon and it was the last year it would be an open. Again, I was not last. Then in 2008, I heard about the North American Cup (NAC) events in the U.S. for those over 40 (Vet 40) and 50-59 age group. So I started to fly twice a year to the States for those competitions. In 2009, I flew overseas to compete in the Commonwealth Veteran Championships in the Channel Islands. I finished 15th out of 30 and was a hair's breath from being in the final 8. I was also in the team event where we lost 45-39 in the bronze medal event. It was so exciting! Before plans are made, Teena's first question is "Are you fencing that day?" She is constantly shifting plans for me to compete as new tournaments are announced. I would not be as successful as I am if she was not behind me. Oh, yeah, that nice healthy hobby I took up to get me off the couch a couple of nights a week? Fencing, it seems, is a hobby that has got horribly out of control. Thanks Steve for a great introduction! I'm loving every minute of it! From a recent NAC in Cincinnati. Aren't I the best wife ever?! Fencing out of control. No, I don't think so. I started two years ago after son took it up. He has stopped, but now he comes to take pictures. He was taking pics at Decemberfest hosted by Excelsoir club in Waterloo. i haven't competed yet, but I suspect one day I'll give it a go.